Together with the cleanser you use, this sonic face brush system cleans and treats your skin. Not only your skin. It is suitable for all types, says the manufacturer. The speedy sonic movement of this facial brush contributes to thoroughly cleanse your skin. This nicely designed brush device also gently purifies the pores. This sonic skin care brush comes with charging base (also to use abroad), replaceable brush head and brush cover. The brush holds charge for a few houres before it is to be recharged and also features an automatic shut off after 30 seconds. - Apply cleanser to moistened skin or brush head. - Use brush device once daily for 30 seconds. - Then build up to 1 minute, twice daily. - Massage in circular motion for 15 seconds on cheeks using white bristles. - Massage in up-and-down motion for 15 seconds on T-Zone using green bristles. - Rinse and pat dry. - Rinse brush head after each use. Expensive, noicy, and probably not as good as the Clarisonic Mia device. Do read the beautypedia review here. Press: below here, to watch the video. 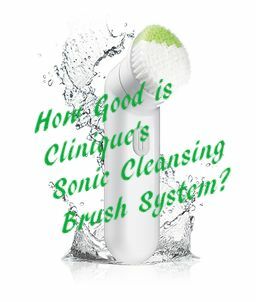 See Amazon for the Clinique Sonic System Purifying Cleansing Brush.